The First Aid Conforming Bandage with pad was designed to treat every possible bleeding wound. The sterile, non-adherent bandage applies pressure to the site, is easily wrapped, secured, and acts as a tourniquet in cases of severe bleeding. It is also widely used in first aid kits for emergency use. 2.EO sterilized, can be used for a variety of small wound to stop bleeding and protect. 3.Sticky is good, strong adhesion to the skin. 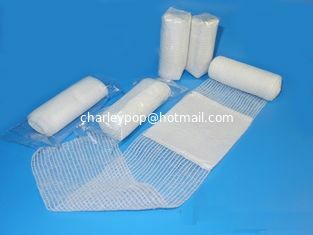 4.Non-woven absorbent pads and non-stick injury mesh membrane. Note: Personalized specifications as possible at customer's request.